There's been a lot of attention about farmers, protection and guns in the media recently. 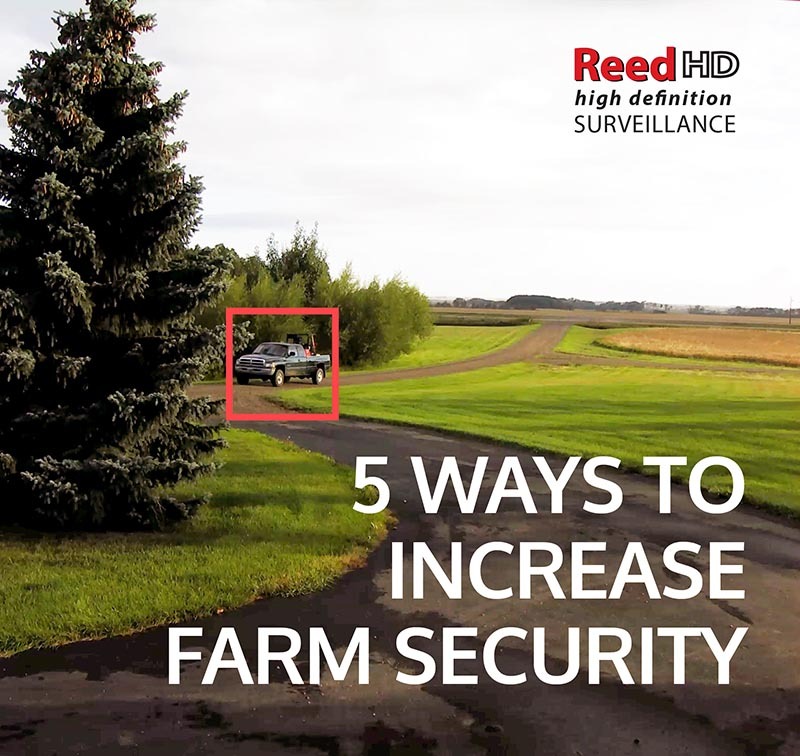 At Reed Security we've seen an increase of 25% about farm security, cabin security and acreage security over the past two years. WHAT ARE FARMERS CONCERNED ABOUT? "We live on a busy highway and a number of people come into our yard. When a lost stranger drives into your yard and asks for directions - are they really lost? Or could it be that they're scoping your place out?" Just about everybody has maps on their smartphones. You should pay particular attention to the make and model of the vehicle and even the license plate if you can. Also make notes about the person's description and age. The Police will need this information in the event of a reported theft. Better security is a better solution. 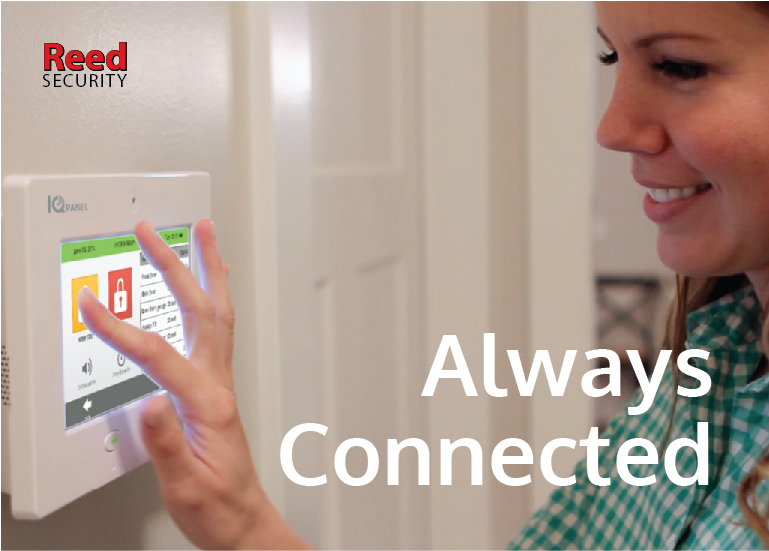 Reed Security recommends installing several layers of security instead of relying on only one. We have some other common sense Security Tips that you should check out. If you are having a problem with theft (or would like to avoid one) , We Can Help! Contact Us today for a Free Security Evaluation. GLOBAL NEWS interviews Virgil Reed on the big increase in farm, acreage and cabin theft and how to stop it. WHAT SENSORS ARE BETTER - WIRED OR WIRELESS? So far in this blog series we have looked at the “brain” of your alarm system (the CPU), and the “mouth” of the alarm system (the Communicator), and seen how the right combination of wired and wireless in these can make for a good, secure system. Today we will be looking at the “eyes and fingers” of the alarm system – the actual sensors and zones. Without these “senses” reporting back to the brain, your system will just sit there idly whilst someone breaks into the property. There are MANY different sorts of sensors which can work on an alarm system: door sensors, motion detectors, low temperate alarms, smoke detectors, pressure sensors, flood detectors…the possibilities are almost endless. These come from many different brands, and have been designed with varying degrees of innovation and quality. I’m not going to get into specific sensors and/or brands today, but what I do want to touch on is whether WIRELESS sensors can or should be used as opposed to WIRED ones. Obviously, a wired sensor requires a wire run from the CPU to each individual zone in the building. Whether it’s a house or a business, finished or new build, this will involve drilling holes. A professional installation company will do their best to ensure that these holes are never visible, but if you ever decide to remove your alarm system ten years down the road, behind each sensor and in every door will be a hole. In addition to that, in a finished building, it can impossible to run wires to certain areas, or at least to hide them. You may end up with visible wires, or with an area that simply cannot be secured by wired devices. This is where wireless devices really shine. Not only can they be mounted almost anywhere with minimal effort, they can often be mounted using double-sided tape, meaning that there are no screw holes beneath the device. These sensors can also be easily moved or re-purposed, eliminating the need to call your service company when you replace a door, for example. Wired devices are invariably much cheaper than wireless ones, but require quite a bit of extra time to run cable and install, so it often evens out. For example, a wired motion sensor costs around $50, but might take 30 minutes of labour to install. A wireless motion sensor may be double the price, but takes 5 minutes to install. In addition to the cost of individual wireless sensors, many systems require a wireless receiver to be installed first. This is a one-time cost, however, and once its there, you can add wireless devices at will. A wireless device is essentially just a wired device with a battery and a wireless transmitter added to it; as such, there are simply more things that can potentially go wrong with a wireless device. Not only that, but wireless devices can potentially pick up interference from other strong RF sources in your house, such as Wi-Fi routers or cordless telephones. Although this is rare, I have had a number of cases where a device just won’t work properly, then we move it 2 feet over and it works like a charm; sort of like a dead spot for your cell phone. Wired devices are renowned for being highly reliable. I have seen wired sensors 25 years old that still work day in and day out. Obviously, it’s electronics, so literally anything can happen; but wired tends to be more stable. Wired devices should not require much in the way of maintenance, with the exception of life safety devices, such as smoke detectors or carbon monoxide detectors, which by design must be replaced every few years. Most wired devices are universally compatible, so if you upgrade your system in ten years’ time, you don’t necessarily have to upgrade every device. Wireless, on the other hand, has the obvious limitation of being battery powered. Every year or two you will have to do the rounds and replace all the batteries; although, to be fair, some newer devices are boasting 5 to 7 years’ battery life nowadays. Some manufacturers also have a tendency to bring out entire new product lines every 10 years, rendering the old wireless incompatible with the new systems. Many systems nowadays are hybrids of theses two schools, having a wired base and utilizing wireless for those hard-to-reach areas. As always, do your research (or find an Alarm Company you can trust to have done it for you), and avoid cheap wireless – you always get what you pay for. A good wireless manufacturer will have two-way communication between the CPU and devices, as well as frequency-hopping for extra security (NOTE: It’s very rare, but I have seen cases where smart criminals have used a Frequency Jammer to immobilize a wireless device, so this feature is a must!). My recommendation for Calgary Alarm system designs: use wired devices whenever possible, but don’t be afraid of wireless. It can save you some serious headaches (and money) when used correctly! WHAT HAPPENS IF I DON'T HAVE A PHONE LINE? In my last blog, we took a look at why all-in-one, fully-wireless alarm systems are so popular, but also why they don’t hold up very well in extreme circumstances. There are other aspects of the system, however, where “wireless” can be a very good thing, including communication. Today we will take a look at how an alarm system communicates with the monitoring station, and the potential benefits to communicating wirelessly. There are essentially three different communication methods available to today’s alarm client, and we’ll look at the pro’s and con’s of each of them. Since the inception of electronic alarm systems in the 1920’s, phone line has been the “traditional” method of communication. Every house and business always had a landline; therefore, it was cheap to implement for the Alarm companies. The technology currently in use hasn’t changed much in decades, and is essentially the same as that used by a fax machine. The problems with this communication method are two fold: the signals are sent slowly (takes around 30-60 seconds for a single signal to be transmitted), and it relies entirely on your phone line. Should the line go down, or should a smart criminal cut the lines coming into the building (I’ve seen it happen), the alarm cannot communicate. Many phone systems also require power, so a power outage renders your system inoperable. Not only that many people are cancelling their landlines. I cannot tell you the number of times a client has called me up saying “my alarm system isn’t working”, only to find out 30 seconds later that they cancelled the home phone line a month ago! There are cheaper, internet-based alternatives to phone lines (known as Voice Over Internet Protocol, or VOIP), but most alarm systems aren’t compatible with them. In the case of internet communication, the alarm system is wired directly into your router provided for you by your Internet Service Provider, or ISP. Wi-Fi operation is a little simpler, as no physical connection to your router is required. Again, this is a cheap option, because the chances are you’re already paying for internet. However, like the land line before it, this method relies entirely on your internet. If the internet goes down, if there’s a power outage, or if your Wi-Fi drops, the Alarm System cannot talk to the monitoring station. These communicators are essentially a small cell phone, and use their own SIM card to communicate over the cell network. The signals are transmitted very fast, and the communicator itself can make use of the Alarm System’s backup battery, meaning that you never lose connectivity, even during a lengthy power outage. Of course, these are still dependent on cell towers, and in rural settings or in deep basements there can be issues getting a signal; but for reliability, these are the best option currently available, and will only improve as the cell coverage and signal type improve. Right now, most use the 3G network, but as things most into 4G, LTE, and beyond, expect these communicators to keep getting smarter and smarter. Note: I should point out that most internet/Wi-Fi/cellular communicators now offer (at an added cost) the ability to use “Crash and Smash” technology. This means that if someone breaks into the property intent on finding and disabling the communicator before the alarm goes off, the system now sends an “Alarm Pending” signal to the servers, which is then forwarded on to the monitoring station 4 minutes later if no other signals are received. This is a great backup, but 4 minutes is still a lot of free time for someone to have roaming around your property unchecked! The bottom line when it comes to communicators is that again, you want something that will ALWAYS send a signal, no matter what the situation or who is trying to compromise your system. There is no one option that is completely flawless, but it’s pretty obvious to me that the Cellular option has the lowest risk-to-benefit ratio. Unfortunately, it is usually the most expensive option, so you have to decide for yourself whether the reliability and speed is worth the extra money. I should also note that any of the non-landline options also open up the door to use smartphone and tablet apps to monitor your system, and send you notifications via text or e-mail if something goes wrong. In todays connected world, having that functionality is almost a no-brainer. My recommendation: pay the extra few bucks every month and get a cellular communicator that you can not only trust, but offers you the benefit of being able to check in on your system when you’re away. 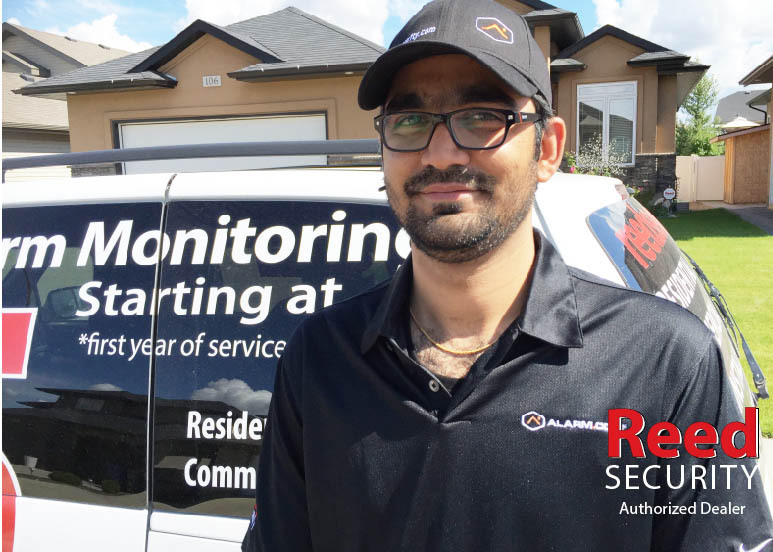 Rahul Patel is a friendly and helpful security technician with over 5 years experience installing security systems across Saskatchewan. He recently opened ViboPulse Services and became a Reed Security Authorized Dealer in Regina, SK. In addition to being an experienced technician, Rahul has a post graduate diploma in Management from Centennial College in Toronto. Owning a business was always his ambition and after working for the competition for 5 years - it was time to become an Owner. 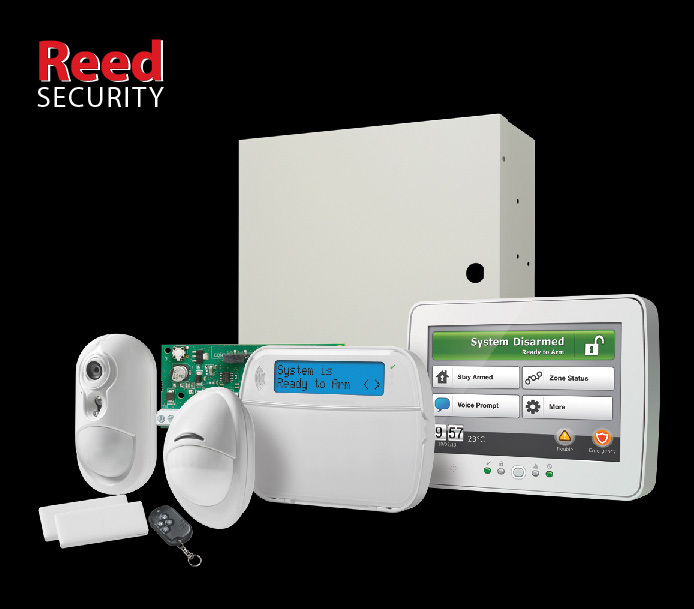 "I reviewed my options and could clearly see why Reed Security was different. 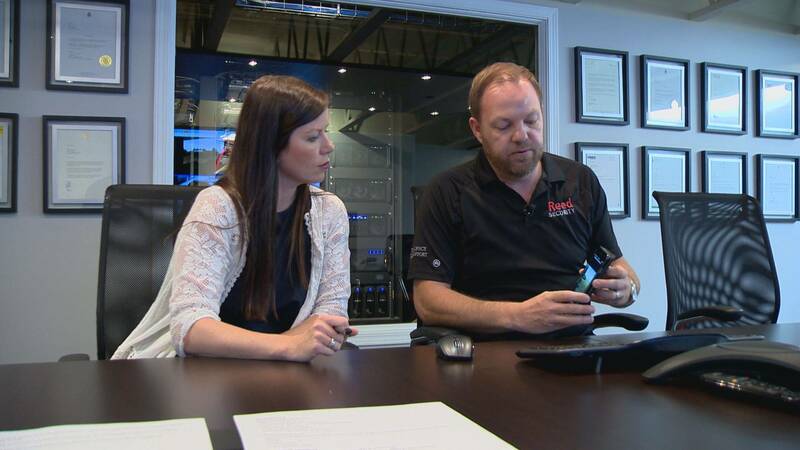 They're local and have kept the Saskatchewan values that have made them successful." "The $5 Promo is the best deal in Canada. You won't find a better combination of Price and Service anywhere." "I'm 100% dedicated to providing our clients above and beyond service. I guarantee you will be Happy."